This is a beautiful but simple palette, containing 6 different shades for contouring and highlighting. This is the light to medium shades and they are lovely colours! I tend to use mainly the middle bottom for contouring, but I need to experiment more with the other shades. I got a few palettes for Christmas and I feel like I’ve neglected them so I really need to reach for these more. The top row of the palette has a setting powder, a yellow setting powder for brightening and then a highlight shade. 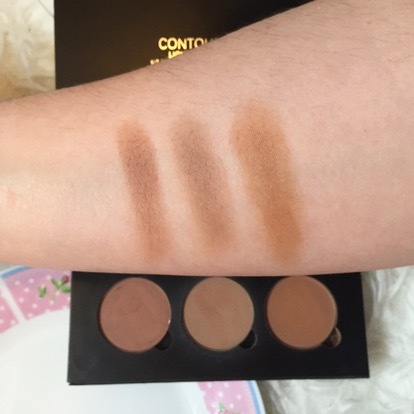 On the bottom are three different contour shades. All the colours have great pigmentation as you can see from the swatches above and blend really easy.